There are web designers, online marketing companies, internet yellow pages, Facebook and a variety of other ways you can spend money to increase your business’ presence on the internet. We take a comprehensive look at your business, and your competition, to determine how you should allocate your resources to maximize the return on your investment. So let's say you own a widget shop and you decide you want a website because the competition is bringing in new customers from the internet. You find a web designer, they build you a website, and you assume that you are now up to speed. What you might not realize is that your website is not geared to target popular keywords for your business. Also, your company listings in popular local search and directory sites were probably not updated to include your web address. With Web SBZ we work with your website budget a bit differently. If your end goal is to attract new customers then you need to do more than build a website. When building a website it is helpful to address the following questions. -Is your website easy to find through search engines like Google and Bing? 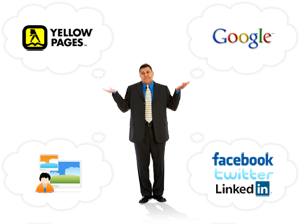 -Is your business listed in the most popular online directories? -Have your current directory listings been updated to include your website? -Do you have positive customer reviews in all of the major business review websites? -Most importantly, how many people are viewing your website and how did they find it? These are just a few of the services provided by Web SBZ. Our goal is to not only design a great website but to make sure that people will see it. We will update you on the traffic to your website, suggest ways to improve, and manage online advertising campaigns. Customers are using the internet to find businesses more everyday and a basic web design company will not give you the best return on your investment. Charlie started Web SBZ under the name "Css Online" in 2008. See our blog to find out Why we changed our name. Charlie manages every project personally and is a skilled developer, designer, and internet marketing consultant. After graduating from Ithaca College in 2007 he worked as a project manager in a local market research firm. After building websites in his spare time for about a year he set out to build his own web design and online marketing business that has grown into Web SBZ. Charlie enjoys basketball, soccer, golf, softball....pretty much anything that involves competition. He also likes to help out at the Main Line YMCA and once spent 3 months volunteering as an English Teacher in Buenos Aires, Argentina. Ask him about discounts for non-profit organizations. Cleo has been with the company since the very beginning. Her responsibilities include answering phones, statistical analysis, and making deposits in the backyard. There is no reason for her to be listed on this website besides that great picture you see to the right, but she has been an great companion during the tough times of starting a business. You can tell from the photo that she is a very hard worker. 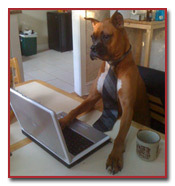 If you come to our office, she will greet you at the door and make sure you are getting the attention you deserve.